Sony UPX-C300 digital passport & ID photo system - PFS / Photo Finishers Supplies Inc. The Sony UPX-C300 digital passport printing system is specifically designed to produce high-quality passport and ID photos that comply with federal requirements. This system is built on the legacy of the "best in class" UPXC200/20 and retains the Bluetooth wireless printing feature and ease of use functionality. The new UPX-C300 is also packed with a host of new features that help ensure fewer rejections by government agencies. From image capture to printing, all functions-including image size adjustments-can be performed easily from the digital camera. When previewing an image before printing the camera operator can adjust its exposure by pressing the up and down control buttons on the digital camera for retake. With the simple press of a button, the operator can automatically adjust an image that is not aligned properly. Please note, in some circumstances, manual adjustment may be required. 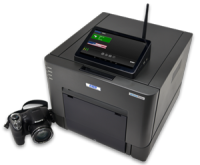 The UPXC300 incorporates state-of-the-art Bluetooth™ wireless technology, which eliminates cable connections between the camera and printer. The US passport size photo format and other formats used by most major countries around the world are pre-installed in the camera for simple and accurate passport photo printing. This feature enables the camera operator to store a number of captured images after preview and print them all together in one batch, rather than having to print each image as it is captured. This feature enables color, dark/light, gamma, and sharpness adjustments from the MENU function of the camera. Color and B/W prints can be made for a variety of applications. The LCD menu supports the following languages: English, French, German, Italian, Spanish, Portuguese, Dutch, Russian and Japanese. To increase productivity, the system can be configured wirelessly with up to three printers. Compact, Space-saving Design The space saving design of the printer enables it to be used in even the smallest retail space. This feature increases the ability to shoot high-quality images. A camera lens filter thread is equipped to allow a choice of different 52mm filters to be attached. The UPXC300 is equipped with a security slot for protection against theft.